Bring me sunshine – HubNut – celebrating the average! 2012 didn’t end particularly well. Work was quiet, my self-esteem took a pounding and months of miserable weather left me feeling very grumpy indeed. 2013 started well. Work was picking up and the first day of the new year was one packed with sunshine. That was good as we joined a 2CV road run in Abergavenny. 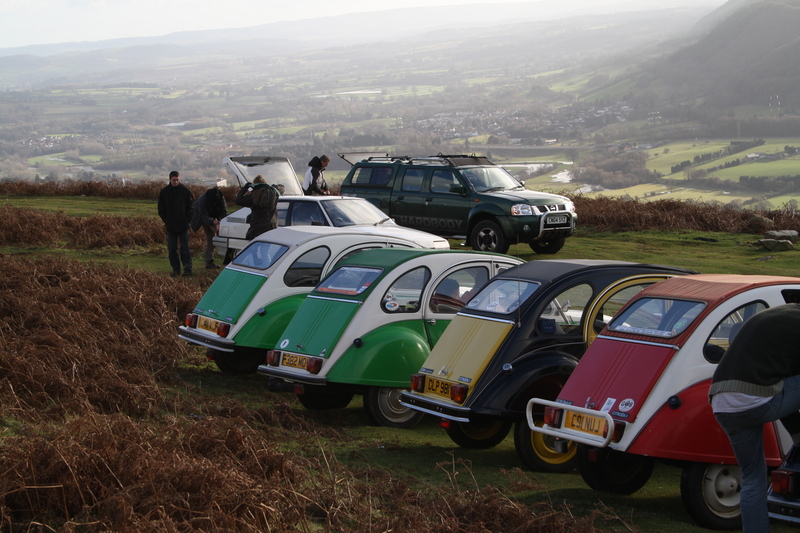 Elly the 2CV and friends atop the Sugar Loaf near Abergavenny. It was a jolly nice start to the year, with a good pub lunch afterwards. The sun shone for most of the day, and it failed to rain even when the sun went shy. A day worthy of celebration. Perhaps 2013 would be ok! Er, no. We then had several days of rain. Ugh! I found myself putting front pads on my BX Turbo Diesel in the rain, then experiencing likewise as I fitted new rear discs and pads to the Green Tiger – my BX diesel estate. Not much fun, but both needed doing. Especially the discs on the state. Shocking. Crap brakes are now not-so-crap brakes! It was a job that didn’t go particularly well, as the small hex-head bolt that holds the disc in place was snapped and broken on one side. In the end, I hammered a smaller socket over it with great success. Certainly more than with my specially-purchased mole grips. They’re rubbish. Note that my arm is covered in sawdust in that photo. That’s because of our heating system. No day is complete without ferrying a load of logs around. Good healthy exercise, but not much fun when it’s raining. Or dark. Anyway, I got the job done eventually, while also doing an awful lot of writing. I’ve been sleeping very well lately! This week, I also had to find time to take two old ladies shopping as part of my volunteer bus duties and the 2CV needed fettling after losing an exhaust clamp on New Year’s Day. On top of that, in a rare burst of organisation, I decided to complete my self-assessment tax return as well. A few months ago, my To Do list was lengthy, but I felt disinclined to do much about it as it was far easier to grumble about how crap things were and eat chocolate. Fortunately, sunshine came along to boost my motivation! Deadlines were met for another week and I rushed outside to make the most of the weather. That largely involved filling the newly-resurrected Green Tiger with rubbish and taking it to the tip. Twice. Green Tiger rides again. A truly excellent workhorse. How good it felt to be cruising around in a recently-revived car, enjoying the spectacular, sun-soaked scenery. I may have only had 71 horses under my throttle foot (and I suspect some of those have gone missing) but life felt good. It’s amazing what a difference a bit of sunshine can make. I then fixed the 2CV’s exhaust and had a quick roof-back hoon in that, which taught me that it was bloody cold. It’s now fuelled up and ready for a 2CV run we’ve organised this coming weekend. BX Turbo Diesel – Improve paintwork, coolant refresh, fix flow-diverter valve leak, flush hydraulics. BX Green Tiger – Clutch and cambelt, welding, general tidy up. 2CV – Welding, paint, service, kingpin, leak prevention, tidy up wiring and general fettling.